oldest Trade Unions in the country. It is the sole recognized union of the class III employees of Reserve Bank of India, the central bank of the country. 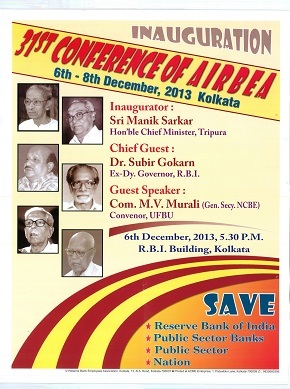 AIRBEA wants RBI to play its developmental role for the upliftment of the Indian millions. AIRBEA is against decimation of the premier institution and dilution of its authority..
AIRBEA upholds the autonomy of Reserve Bank for the protection of Indian banking system and people’s money. AIRBEA stands for public sector banking and public sector for nations progress and prosperity. AIRBEA works for nations interest, institutional interest and also for the interest of its members AIRBEA has a pro people vision and mission.